The seventh season of the fantasy drama television series Game of Thrones is set to premiere on HBO on July 16, 2017, and conclude six weeks later on August 27, 2017. Unlike previous seasons that consisted of ten episodes each, the seventh season will consist of only seven. Like the previous season, it will largely consist of original content currently not found in George R. R. Martin's A Song of Ice and Fire series, and will also adapt material Martin revealed to showrunners about the upcoming novels in the series. 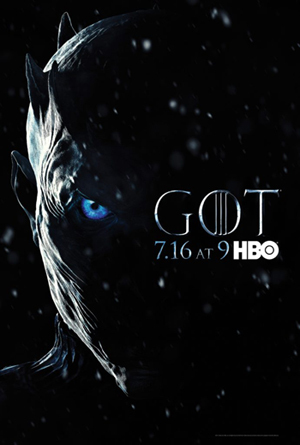 The series is adapted for television by David Benioff and D. B. Weiss. HBO ordered the seventh season on April 21, 2016, three days before the premiere of the show's sixth season, and began filming on August 31, 2016. The season was filmed primarily in Northern Ireland, Spain, and Iceland. Game of Thrones is an American fantasy drama television series created by David Benioff and D. B. Weiss. The series is based on the A Song of Ice and Fire novels by author George R. R. Martin. The series takes place on the fictional continents of Westeros and Essos and chronicles the power struggles among noble families as they fight for control of the Iron Throne of the Seven Kingdoms. The series starts when House Stark, led by Lord Eddard "Ned" Stark (Sean Bean) is drawn into schemes against King Robert Baratheon (Mark Addy) when the Hand of the King Jon Arryn (Robert's chief advisor) dies mysteriously. The series premiered on April 17, 2011, on HBO. David Benioff and D. B. Weiss both serve as executive producers along with Carolyn Strauss, Frank Doelger, Bernadette Caulfield and George R. R. Martin. Filming for the series has taken place in a number of locations, including Croatia, Northern Ireland, Iceland and Spain. Episodes are broadcast on Sunday at 9:00 pm Eastern Time, and the episodes for season one to six are between 50 and 69 minutes in length. The first six seasons are available on DVD and Blu-ray. As of June 26, 2016, 60 episodes of Game of Thrones have aired, concluding the sixth season. The series was renewed for a seventh season in April 2016, which will consist of seven episodes and premiere on July 16, 2017. The series will conclude with its eighth season, which will consist of six episodes. The show's episodes have won a number of awards, including two Primetime Emmy Award for Outstanding Drama Series. For the complete listing of all the episodes, see Wikipedia's List of Game of Thrones episodes.